Elsewhere, Demetrious Johnson took less than three minutes to easily get the better of Henry Cejudo. IT WASN’T PRETTY but if was effective and Jon Jones is the interim light heavyweight champion after beating Ovince Saint Preux by decision at UFC 197 in Las Vegas. Out of the cage for fifteen months due to a litany of misdemeanours, including being charged with a hit-and-run felony last year (being stripped of his title as a result), the 28-year-old inevitably looked rusty against the late stand-in. Jones was scheduled to fight Daniel Cormier in a rematch but Cormier had to pull out on April 1 because of injury. 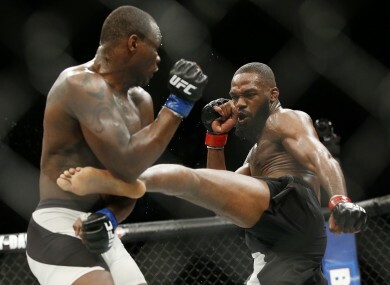 Ultimately, Jones was never in danger against OSP, who broke an arm during the bout, but found it difficult to build any sort of momentum. Still, there was little debate among the judges after five rounds with the official scores 50-45, 50-45, 50-44 in Jones’ favour. “It definitely took me a while to pull the trigger tonight,” Jones admitted afterwards. It seems that Jones could take on Cormier at UFC 200 in July, now that the Conor McGregor/Nate Diaz fight looks like not going ahead. Cormier is scheduled to have an MRI scan on Monday and if he gets the all-clear, the high-profile rematch is a real possibility. Elsewhere on Saturday, Demetrious Johnson took just 2 minutes and 49 seconds to defeat 2008 Olympic gold medal wrestler Henry Cejudo by TKO and defend his flyweight title for a remarkable eighth time. The 29-year-old from Kentucky is catching up fast to Anderson Silva’s record of ten consecutive defences. Some thought Cejudo could trouble Johnson due to his wrestling prowess but it never quite worked out that way and despite a brief takedown after ninety seconds, Johnson recovered and scored a devastasting knockout – a left knee to the head, a left hook and a succession of knees to the body. And in the lightweight battle between Anthony Pettis and Edson Barboza, it was the latter who picked up a relatively surprising victory thanks to a unanimous decision. It was a third straight defeat for the former champion, who lost his title thirteen months ago to Rafael Dos Anjos. Email “After 15-month absence, Jon Jones returns to take interim light heavyweight title at UFC 197 ”. Feedback on “After 15-month absence, Jon Jones returns to take interim light heavyweight title at UFC 197 ”.